Our government wants to help foreign corporations, like Monsanto, dump genetically modified (GM) seeds on our farmers and ultimately GM food on our plate. 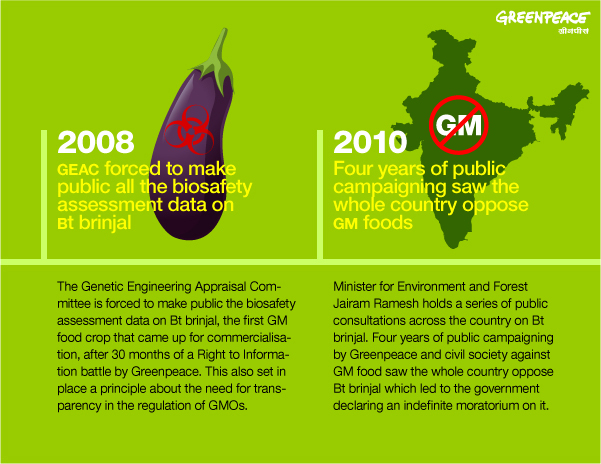 They want to create a Biotechnology Regulatory Authority of India (BRAI) which will approve GM crops, without even considering your opinion or mine. Lakhs of people have been protesting against the bill that will create BRAI. They have succeeded in stalling it for three years, but the threat of the bill getting cleared still lingers. You can make this effort to save our food a big success. Join hands with lakhs of people, who have saved our food so far, to prevent the creation of BRAI. The BRAI bill was introduced, rather slyly, in the Budget session of Parliament in 2013. Right now, it’s being reviewed by a Standing Committee on Science, Technology, Environment and Forests. There are chances of it being presented again in the Monsoon session of Parliament in August. We can't let this happen. This is our chance to make sure that our right to eat safe and healthy food is not taken away by foreign multinational seed corporations. Join now if you want to have a say in the food you eat.